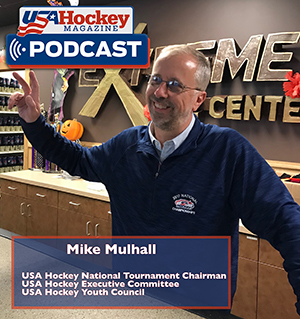 This podcast features Mike Mulhall, who is the USA Hockey National Tournament Chairman, as well as part of the USAH Executive Committee and USAH Youth Council. Mulhall talks all things USA Hockey Nationals, from the selection process, to picking host sites and the work that goes on behind the scenes of putting on a great event and much more in the latest episode of the USA Hockey Magazine Podcast. Follow us on Facebook, Instagram, and Twitter for more from USA Hockey Magazine. Stay tuned for our next podcast, which goes live Friday, March 15.